100 years ago today, Emperor Franz Joseph of Austria-Hungary issued a declaration to his people. The Emperor, seeing Serbian aggression as intolerable, chose war. On 28 July 1914 Austria-Hungary found itself in a state of war against Serbia. The First World War had begun. 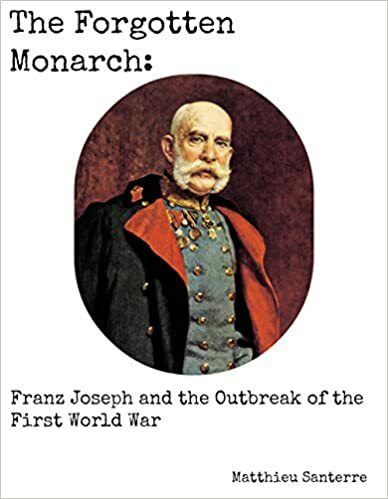 “To my people!” Emperor Franz Joseph’s declaration of war. Bad Ischl, 28 July 1914. It is my duty to assign the Minister of my house and the Minister of Foreign Affairs to notify the royal Serbian government of the state of war between the monarchy and Serbia. At this fateful hour it is my beloved people to whom I must turn. I call on you, therefore, to bring this proclamation to the attention of the general public. It was my dearest wish to devote the remaining years that God may grant me to works of peace and to protect my people from the heavy sacrifices and burdens of war. The machinations of a hateful opponent force me, after long years of peace, to take up arms to protect the honour of my monarchy, to safeguard its reputation and its authority. Years ago, the Kingdom of Serbia, which from the very beginnings of its national independence until very recently was supported and encouraged by my predecessors and by me, demonstrated its fickle ingratitude by choosing the path of open hostility towards Austria-Hungary. When, after three decades of promoting peace in Bosnia and Herzegovina, I extended my sovereign rights to these countries, my decree lead to outbreaks of unbridled passion and bitter hatred in the Kingdom of Serbia, whose rights were in no way infringed. At that time my government made use of the privileges of power and as patiently and gently as it could requested only that Serbia reduce its army to peacetime proportions and promise in future to follow the path of peace and friendship. 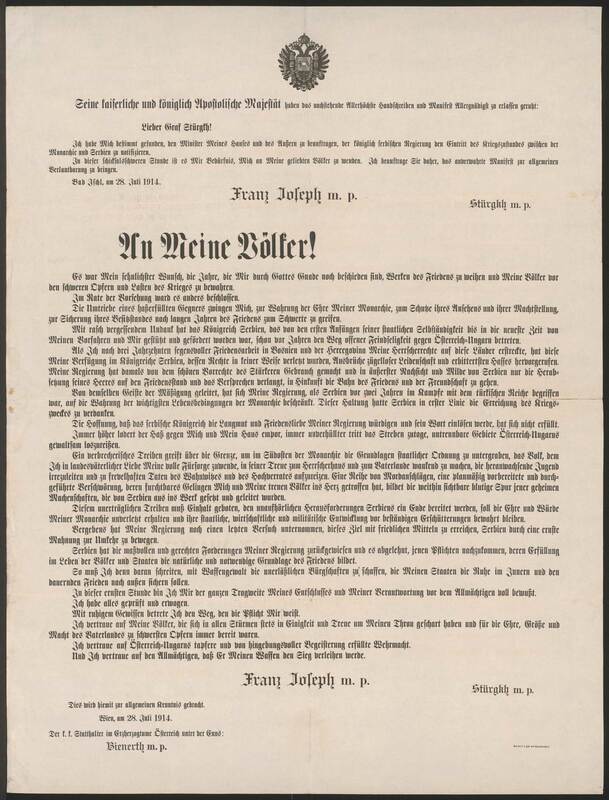 “To my people!” Franz Joseph’s declaration of war on Serbia. Guided by the same spirit of moderation, my government, when Serbia was in the grip of conflict with the Ottoman Empire two years ago, restricted itself to preserving only the most essential living conditions of the Monarchy. It was due primarily to this approach that Serbia achieved its war aims. The hope that the Serbian Kingdom would acknowledge the patience and pacifism of my government and would honour its word, did not materialise. 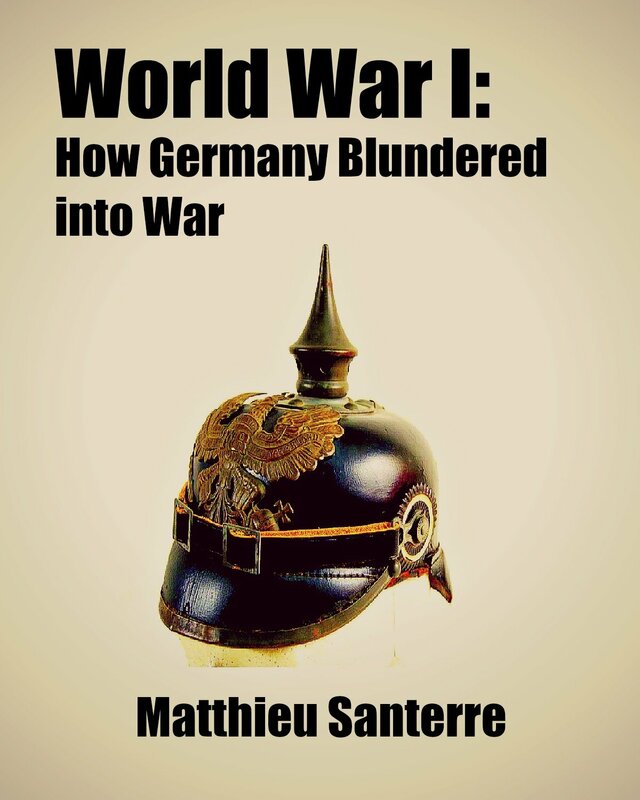 More and more hatred was heaped upon me and my House, increasingly unconcealed was the desire to use violence to tear apart inseparable Austro-Hungarian territories. A criminal force stretches over the border to undermine the principles of national order in the south-east of the monarchy, to make the people, to whom I, with sovereign love, devote all my attention, waver in their loyalty to the Upper House and to the Fatherland, to lead the young astray and incite them to wanton acts of sheer foolishness and high treason. Those secret machinations, implemented and driven by Serbia, have formed a clearly visible trail of blood established by a number of assassination attempts, a conspiracy systematically prepared and carried out, whose terrible success has deeply saddened me and my people. This unbearable force must be stopped and an end must be put to Serbia’s incessant provocation, the honour and dignity of my monarchy must be kept intact and its national, economic and military development must be protected from constant shocks. My government has in vain made one last attempt to achieve this goal by peaceful means and to issue fair warning to Serbia in order to persuade her to change her course. Serbia has rejected the moderate and fair demands of my government and has refused to observe those obligations whose fulfillment establishes the natural and necessary principle of peace in the lives of the people and governments. So I must proceed by force of arms to make the pledges essential in ensuring the internal peace and the lasting external peace of my country. At this solemn hour I am fully aware of the importance of my decision and my responsibility before the Almighty. I have verified and considered everything. It is with a clear conscience that I tread the path that it is my duty to follow. I trust in my people, who have always gathered round my throne in harmony and loyalty in times of hardship and have always been prepared to make the ultimate sacrifice for the honour, greatness and strength of the Fatherland. I trust in the devotion and enthusiasm of Austria-Hungary’s brave armed forces. And I trust in the Almighty, that He will grant me victory in the fight. Reblogged this on English Literature Rules. If only it had stopped with Austria-Hungary and Serbia!